ETCETERA .. Gorge Bridge gets makeover. 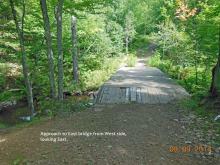 This photo is of the East bridge in the Swedetown Gorge Trail. 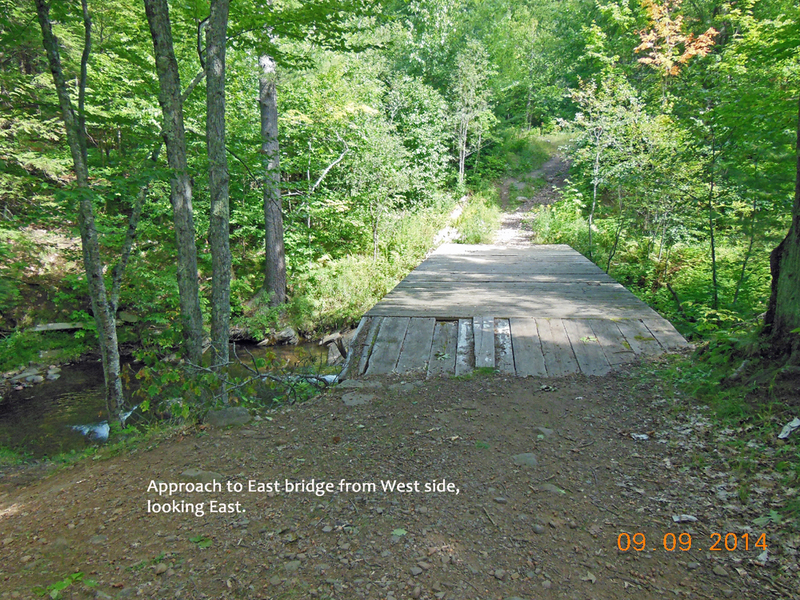 The planking and other updates were redone in recent weeks, to get ready for a replacement next spring of the Middle Bridge in the Gorge. See the link at the beginning of the pictorial. MAKE A DIFFERENCE DAY. 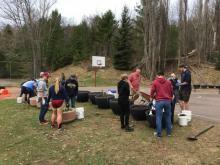 Once again our City turns out to participate in this clean up, fix up day. 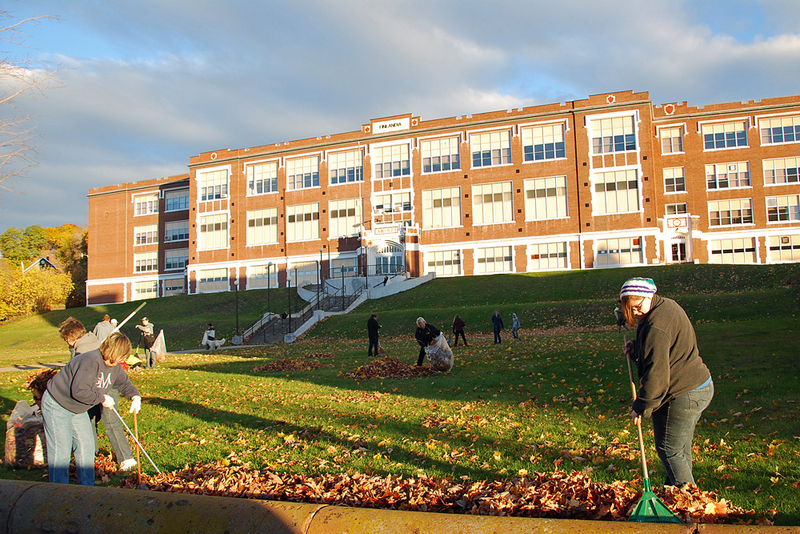 One of the projects was to rake up the Quincy Green area. 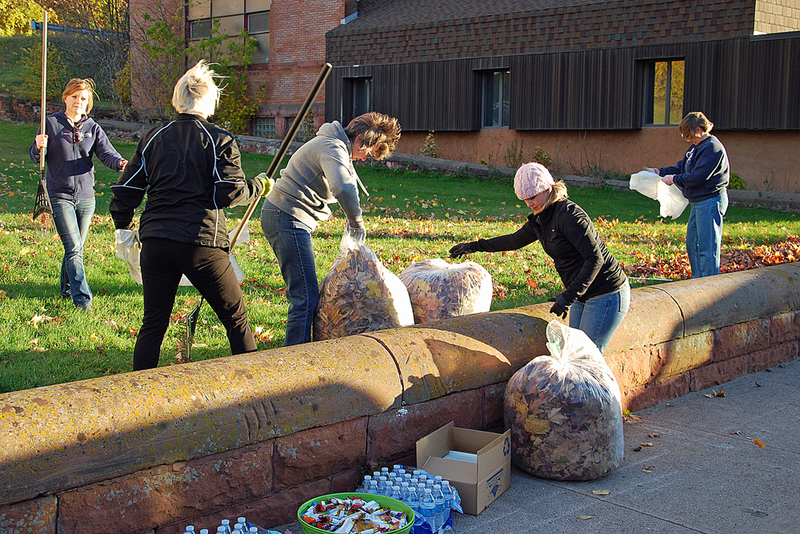 The volunteers also worked in other areas of the City, to Make A Difference, in our community, on October 25th, National Make A Difference Day. 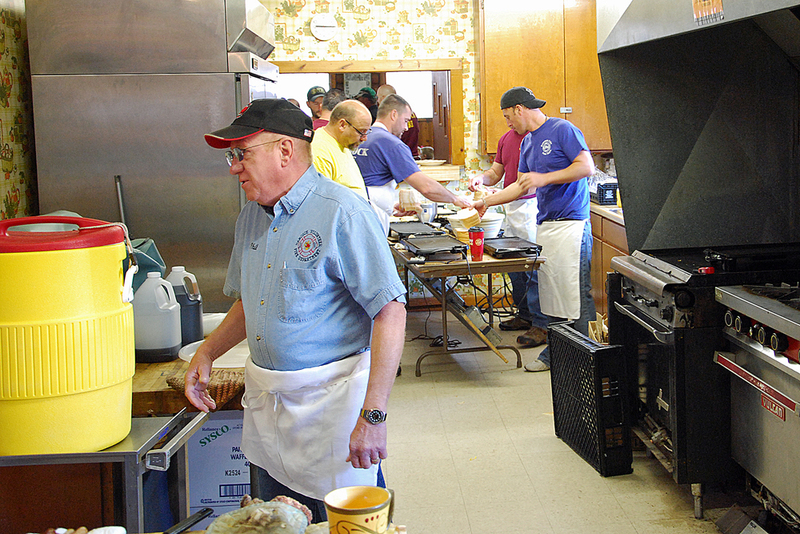 The annual Hancock City VFD fund-raising Breakfast, held each year in late October, at the Hancock American Legion Post 186. Desert snacks are readied for consumption, after a great breakfast. Firemen are busy cooking pancakes and sausages at the pickup window. 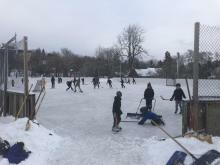 All proceeds are used by the Department to fund equipment not generally available through other funding sources. 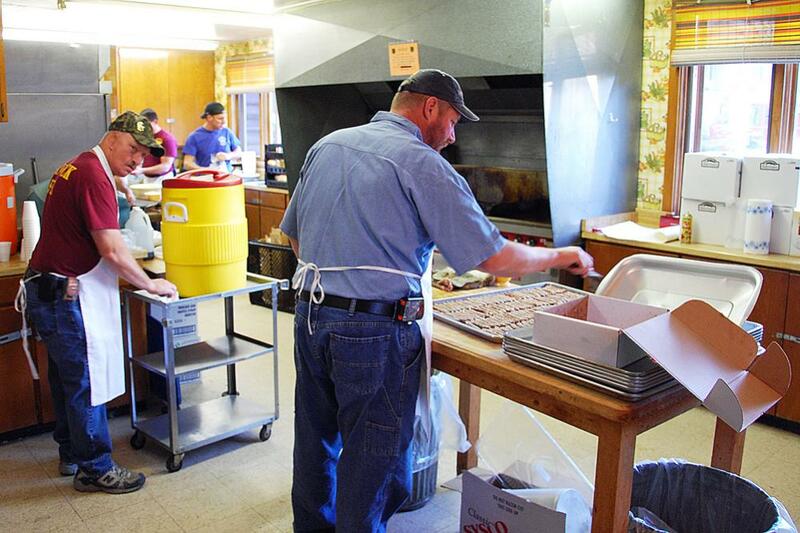 A good turnout, and a great breakfast. 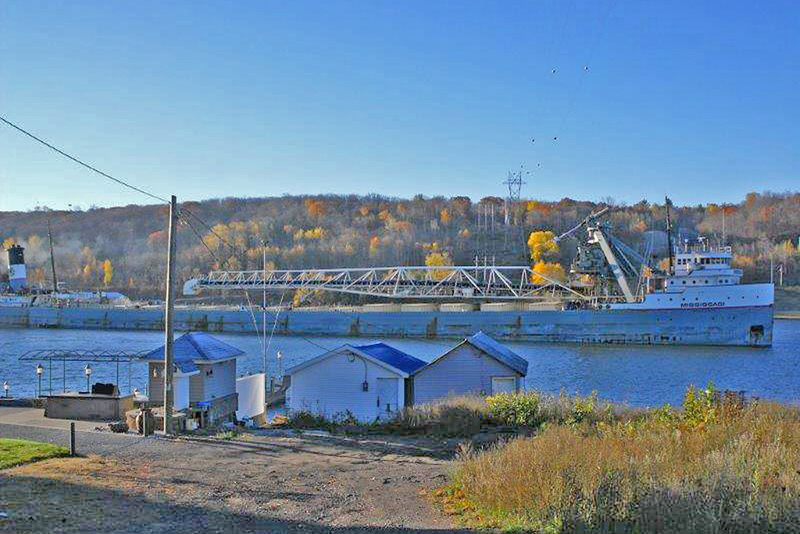 The M/V Mississagi (609 ft.), arrives at the Mattila Dock on October 22nd., to bring in the final 14,000 tons of salt. This vessel was built in 1943, as one of a number that were built to help carry raw materials for the WWII effort. Photo credit goes to Jeffrey Stricker, Calumet area. 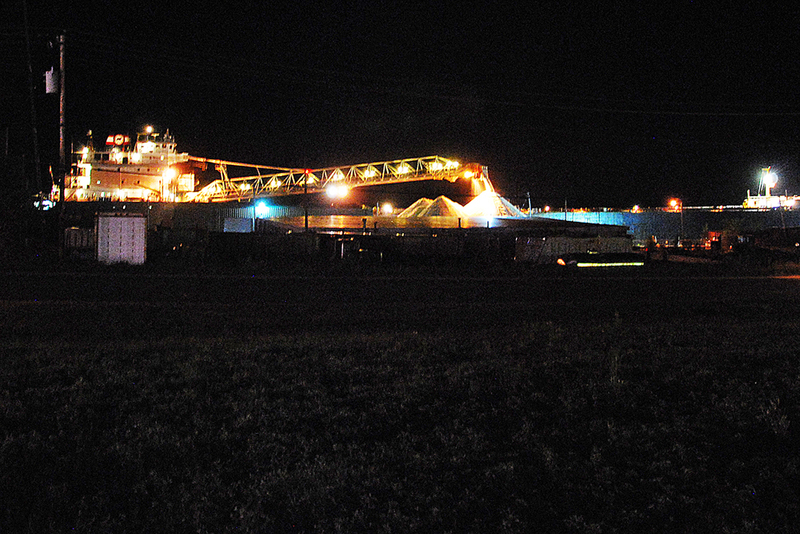 The Canadian M/V Algowood, unloading 17,000 tons of salt on Oct. 12th, 2014, at the Mattila Dock in Hancock. It is part of a larger shipment due in for this year for the W.U.P. 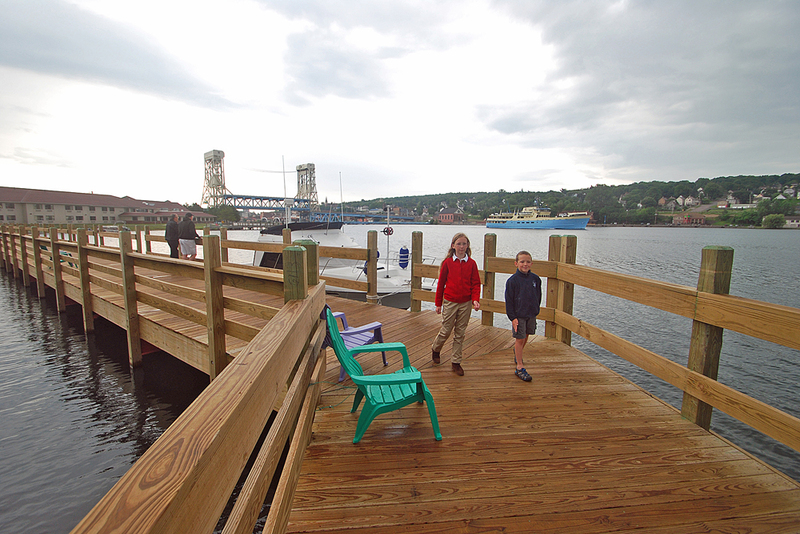 The National Park Service vessel Ranger III, on its way to Rock Harbor, Isle Royale, passes by the new Boardwalk, as board walkers use the new facility. 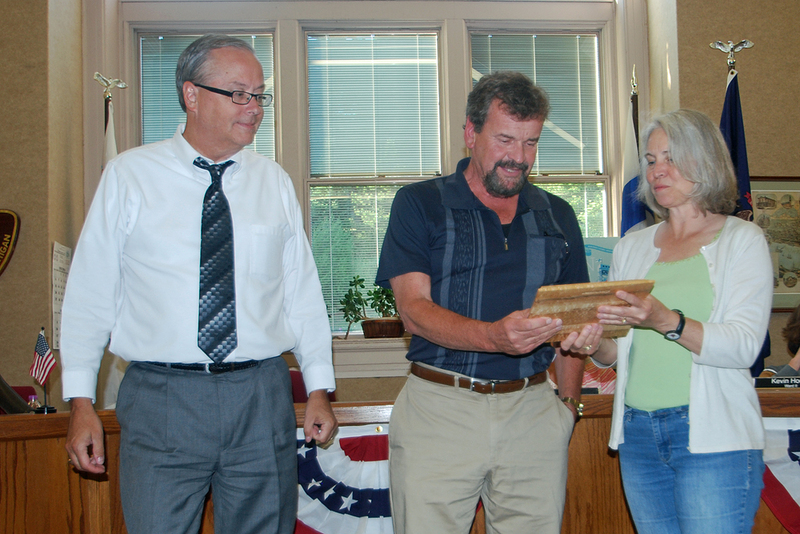 Former Hancock City Mayor & Councilperson Bill Laitila, returned to the Copper Country in July from his new home in Wyoming, to receive an Award from the City Council for his years of service to the Community. 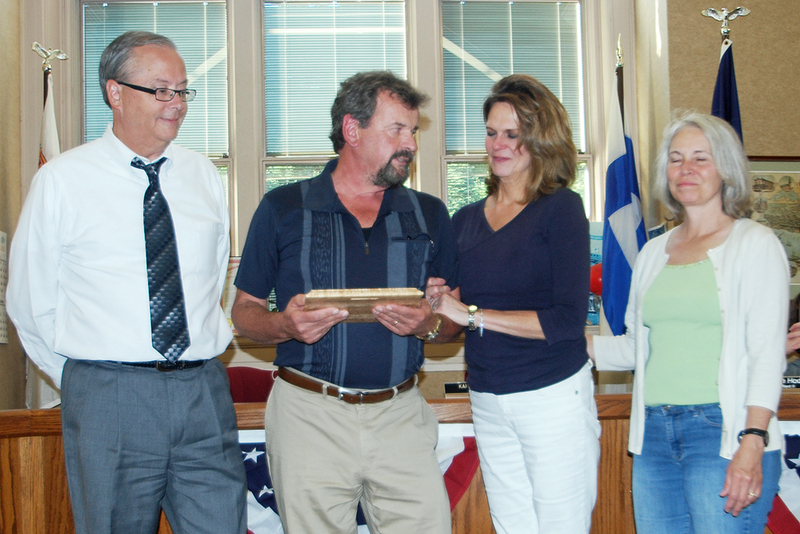 City Manager Glenn Anderson (L) and Mayor Lisa McKenzie, present him with a Plaque honoring his service. Bill is joined by his bride of one month, Shan, who is from Cody, Wyoming. Congratulations, Bill, and enjoy your retirement (from Michigan Tech University). All the best. 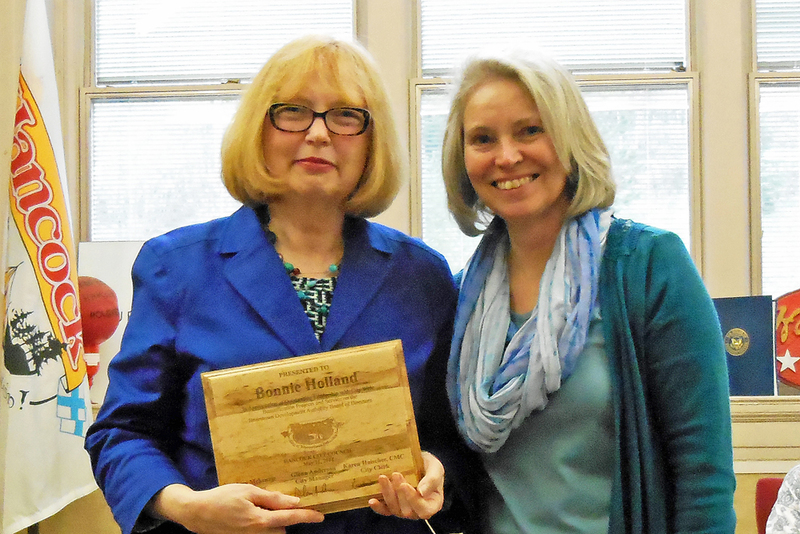 Bonnie Holland (L) receives a Commendation from the City, for her efforts on behalf of the Downtown Development Assoc.. City Mayor Lisa McKenzie makes the award. By later in May, all the walls are up, an existing north wall has been opened up, and it awaits the roof steel trusses. 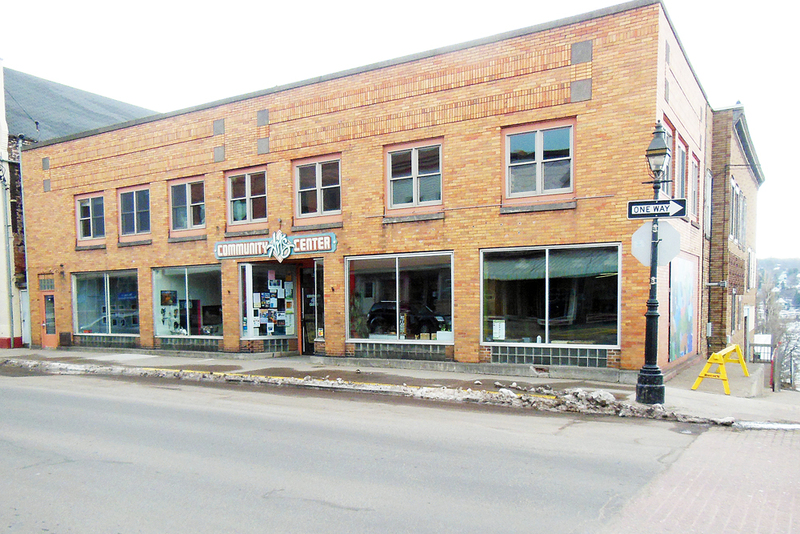 With a little snow still showing from our late April snow storm, the Community Arts Center has received a significant funding opportunity, in the form of a match donation, of $10,000, from Nanno & William Rose, of Houghton. The Roses will match a donation total from the community up to $10,000, received by the end of June. The $20,000 total (if $10,000 is raised in donations) will go to the CAC’s general fund, which underwrites such activities as art classes, summer camps, and various other painting and arts activities. 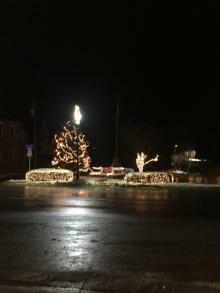 CAC Executive Director Cynthia Cote, said donations towards the matching grant, may be made online, at.. (see link at top of page), mailed to the CAC at 126 Quincy St., Hancock, MI, 49930, or, brought into the Center. Please consider donating to this good cause In what may be his last official visit to the area, U.S. Senator Carl Levin (MI), appeared at the MTU Lakeshore Center Smart Zone, on March 21st. Shown in the photo: (L) Hancock City Manager Glenn Anderson, Eric Waara, MTU President Glenn Mroz, Marilyn Clark, Senator Carl Levin and State Representative Scott Dianda. Senator Levin was first elected to the U.S. Senate in 1978, and has announced he will not run for reelection next year. His term expires in January, 2014. 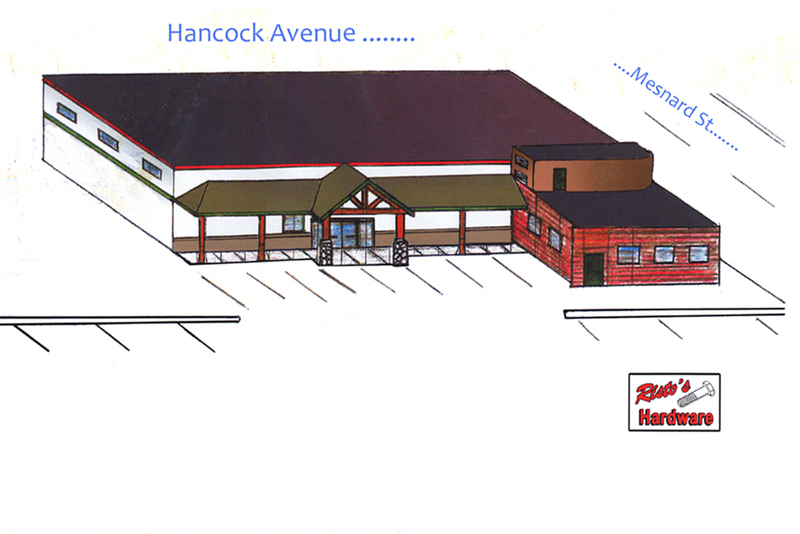 A conceptual drawing of the soon-to-be new Risto’s Hardware Store in Hancock (drawing by owner). It will occupy the already existing former Salvation Army Thrift Store, with a to-be constructed addition. 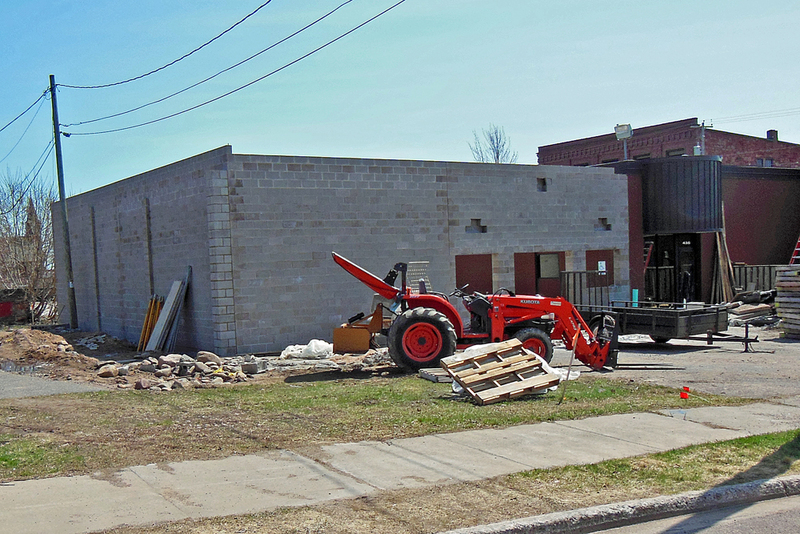 With the owner acting as General Contractor, MJO Contracting will be the prime sub contractor. 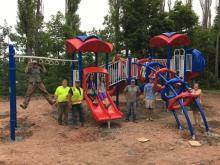 Additional work will begin when footings can be poured. The original building has been gutted, and work is under way in that section to create the new interior. Stop in at Risto’s to chat with them about the new store, which will be located at Mesnard and Hancock Ave. A winter Tori (Market) was held recently, at the Hancock Methodist Church. 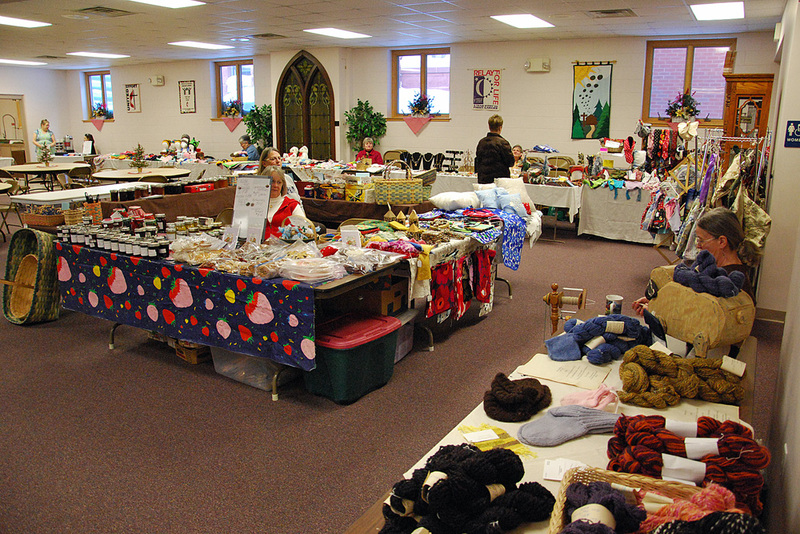 A variety of items were displayed and put on sale. These photos, taken shortly after the Tori opened for visitors, show many of the items being offered for sale. 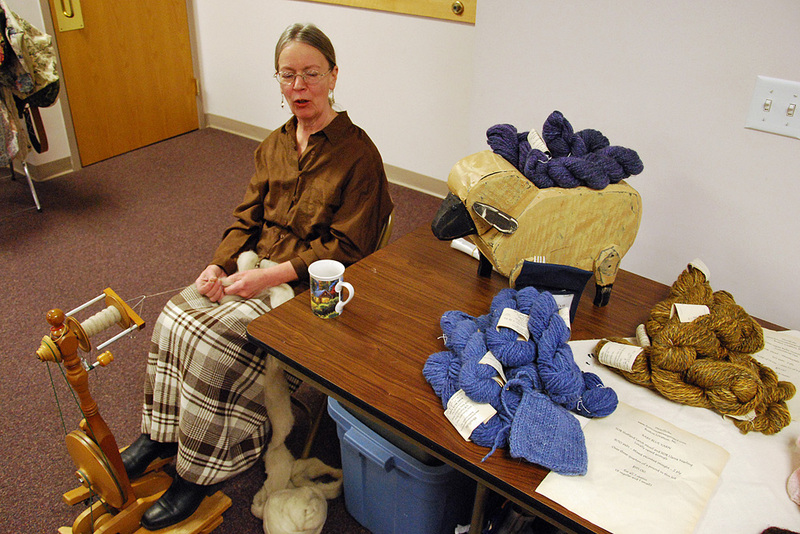 Jean Medlyn demonstrates a knitting string wheel, and shows a number of strings made that way. 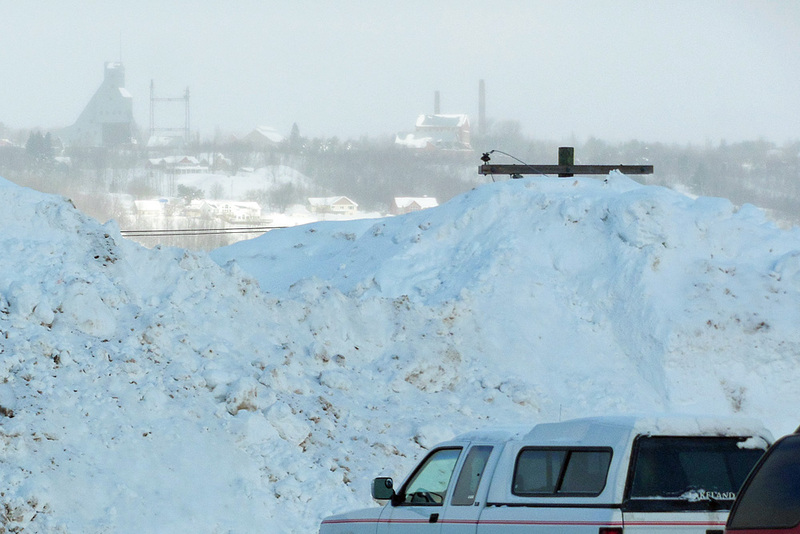 With light snow in the air, and the City of Hancock and Quincy Hill in the background, this utility pole is close to disappearing into the growing pile of snow. This has been one of the snowiest winters in recent years. “When the going gets tough, and the snow gets deep” .... time to move up from the the typical snowblower. 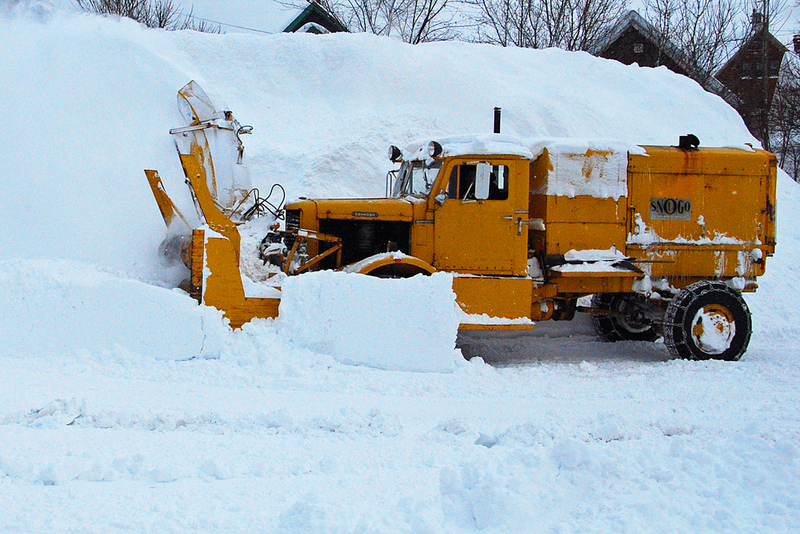 (Current snowfall in the Keweenaw, January 10th, stands at 177" ). 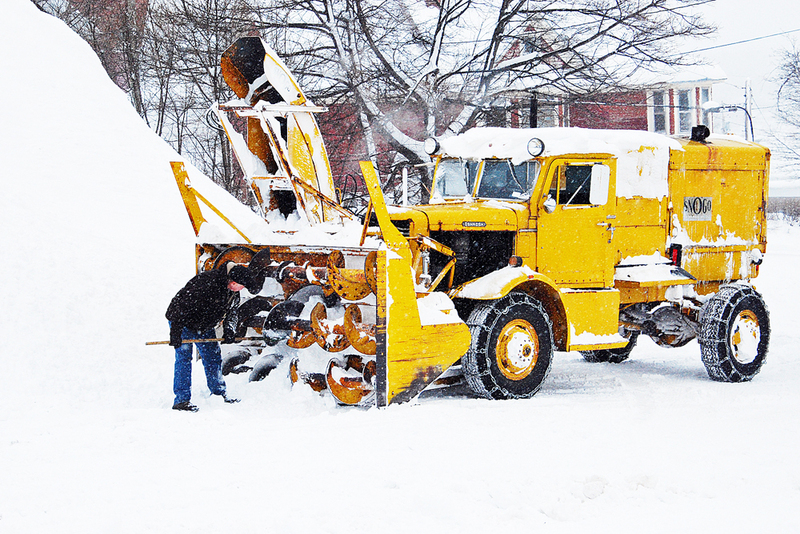 This old timer (made by Oshkosh in the late 1940s/early 1950s) is just the ticket for heavy snow removal, capable of throwing snow over 100 ft. This unit, owned by Northern Auto Co., in Hancock, still does what it was designed to do, although even these ‘SNOGOs’ occasionally need impeller clean out. This type of equipment was gradually replaced by snow throwers mounted on front end loaders for more year round versatility. SNOGOs saw use in every northern State and Canada.